In Nov. 1998 my Master's thesis-turned-book, NetAprendizagem: A Internet na Educação (NetLearning: The Internet in Education), was published by Porto Editora. The public launch of the book was organized by the publisher, took place at ESHTE in Estoril and was presided by Eng. Vasco Teixeira, the CEO of this well-known Portuguese publishing company. It was an event mainly for teachers (around 300), but I was also very fortunate to have my parents, husband, two sons and a few other family members there with me. There was a panel of guest speakers invited by me, colleagues and friends who were at the forefront of educational technology. We all said a few words and then answered questions from the audience. I was very proud to be the main guest at an event I'd never dreamed of. My book was a pioneer work in Portugal in the words of Professor António Dias de Figueiredo from Coimbra University, who argued my thesis with me, enthusiastically recommended it be published and then prefaced the book. However, it didn't have the success we'd all wished. It could have and should have. First, because Prof. Dias de Figueiredo had been the mentor of a national program that introduced Educational Technology in Portuguese schools in 1985. And teachers had been granted free professional development all those years through that program. Second, because we hoped the world of Education would take a radical turn into the future, embrace a different type of technology in schools and usher in the 21st century ahead of time. In my humble opinion, I think NetAprendizagem was ahead of its time. Unfortunately, it was taken out of print in 2006. A couple of years later I asked Porto Editora if they'd give me a file of the book and allow me to make it available for free in my website. After all, it was still current. Everything was graciously granted. No doubt, I "am" a very proud member of the Porto Editora Family. It is with great pleasure that I make it available in this website today (17 Jun. 2014). Please click the book cover. Two other works will be included very shortly. After three very successful email exchanges between students of mine and two classes in Florida, USA, and another in Florianópolis, Brazil (links in my Resumé), I felt very enthusiastic about carrying out a research project on the use of email in the classroom. I prepared a detailed plan and sent it to Professor António Dias de Figueiredo asking for his opinion and if he would be my project mentor. He said "Yes!" to both questions. I requested a sabbatical from the Portuguese Ministry of Education and got it for the 2000-2001 school year. I travelled to Pittsburgh for three weeks in October 2000 to do research for the project. I stayed at Claire Bradin Siskin's house, who at the time was the Director of the Media Lab of the University of Pittsburgh. I brought loads os books and photocopies home and embraced the research and writing parts of the project with great excitement. In March 2001 I went back to the United States to attend the TESOL Conference in St. Louis, Missouri, where I hoped to hear about innovative email projects. I did and got permission from their authors to use them in my sabbatical work. The project was accepted by Prof. Dias de Figueiredo and sent to the Ministry of Education in July 2001. I hoped the Ministry would publish it, but as the weeks and months went by, no results. In 2002 they regretted not being able to publish it due to financial restraints. I knew Porto Editora was interested in publishing it, so I immediatey asked the Ministry of Education for permission, which was granted. The book came out in Dec. 2002 and, once again, Prof. Dias de Figueiredo considered it a pioneer work in Portugal. 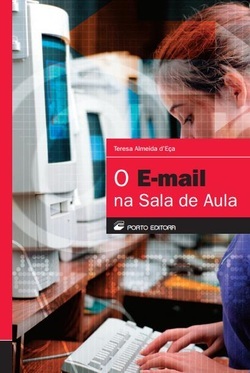 O Email na Sala de Aula describes different types of projects at different grade levels and disciplines to be could be carried out by email. Quite a few of the ideas can be used today and adapted to other (free) multimedia Web-based communication tools. Sadly, it was also taken out of print a few years ago by Porto Editora, but graciously made available to me (at exactly the same time as NetAprendizagem) to be published in my website. It is with great pleasure that I make it available in this website today (18 Jun. 2014). Please click the book cover. I researched and wrote this paper in 1995, because I was interested in exploring slips, mistakes and errors in oral and written English. This is the end product that I thought of publishing, but never did. Self-publishing was unheard of back then and a few months later I entered my Master's program. I had no time except for teaching and studying. Anyway, I made this publication available in my website several years ago and in Oct. 2010 I published it in ISSUU. You have the embedded version above. If you prefer the direct link, click here.